With an incredibly important national election coming up, it’s more critical than ever that everyone who can vote does — and is able to. 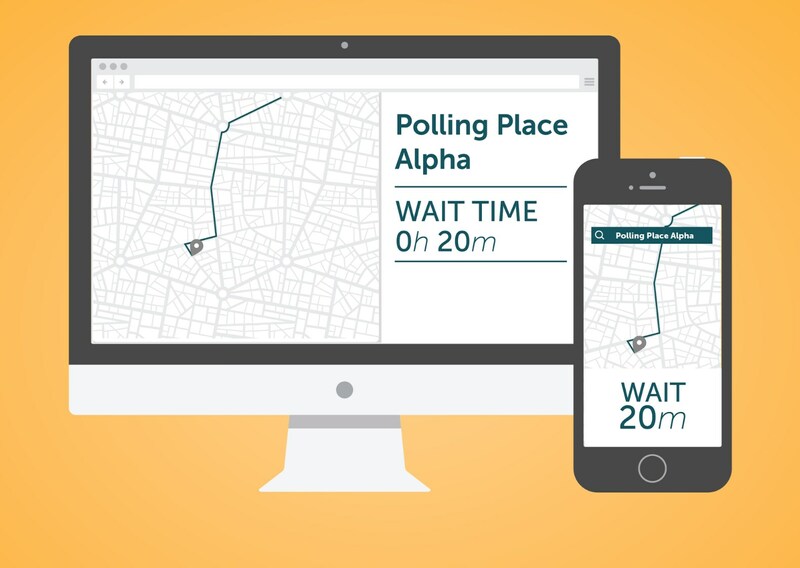 Election tech firm Free and Fair is hoping to help avoid overflowing voting locations with a simple, open source device that automatically monitors waiting times and keeps voters and officials informed. 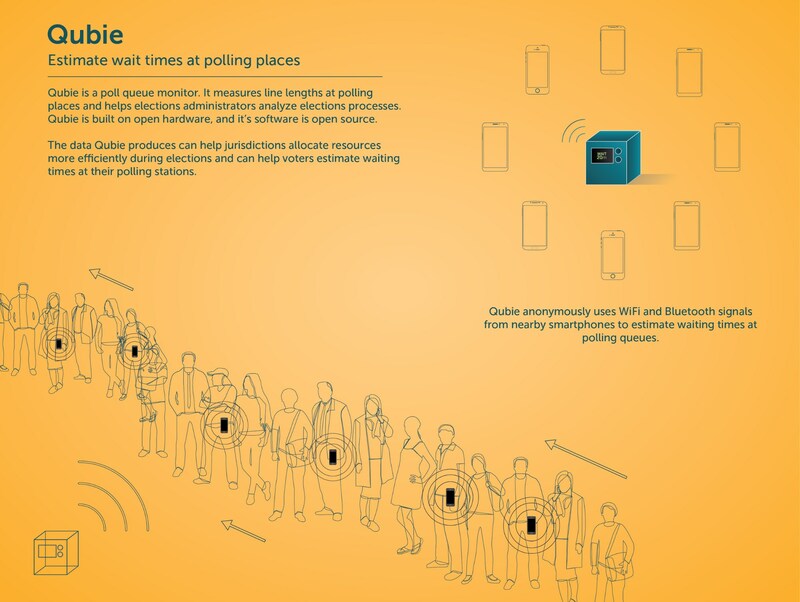 Free and Fair creates open source software for polling places, from checking in voters to actually taking and tallying votes — but Qubie is the company’s first original hardware, created for the Hackaday Prize. Founder Daniel Zimmerman explained that it was just another aspect of the voting process that struck them as out of date. Some tracking is already done, of course, but it’s often haphazard. During a major election, voting officials and volunteers are busy enough, and averaging the wait times of several people every hour (using counters or paper numbers) just isn’t a high priority. Qubie is a simple device: a Raspberry Pi with a small wireless adapter, and powered over USB or with a battery. It identifies phones from Wi-Fi signals, then monitors the time spent by the device with in range of the Qubie — boom, you’ve got a good idea of the average time it takes someone to vote at that location. Naturally not everyone will be keen on the idea that their phone is being tracked — which is why no private information is collected or stored. To be specific, the Qubie detects the MAC address of a device and instantly hashes it with an ephemeral key generated on startup. These hashed IDs are what get tracked by the software, along with Wi-Fi channel and signal strength. When you think about it, officials will be writing down every voter who comes by, and of course voting is in a way a public act — so what Qubie is collecting is pretty tame. All the same, Free and Fair has made sheets to display alongside the device that explain what it does and how to request more info. For now, as Qubie is still very much a work in progress, the data is all stored locally and then can be collected later — of course, that doesn’t get real-time results. How exactly to do that without overstepping is part of what the company is figuring out now. It could do the processing on board and have that info available to officials, or send it to a central cloud for live updates in apps or a website — there’s time to figure that out, and some locations will obviously prefer one approach over another. A test deployment of ten Qubies worked fine, producing data that agreed with ground truth, and Free and Fair is hoping to get the devices into more hands, perhaps in time for use during the national election in November. The company also aims to make a custom enclosure so the thing doesn’t look like an IED. “If you saw that thing sitting out in a random public place, you’d probably be concerned,” Zimmerman said, and not in jest. People are pretty highly strung on election days. The device and its software are open source, so you can build your own, though guerilla deployment doesn’t seem advisable. Still, if a gadget like Qubie can make the voting process even a little easier or more accountable, it’s worth pursuing. Ask your local officials whether something like this might be helpful.